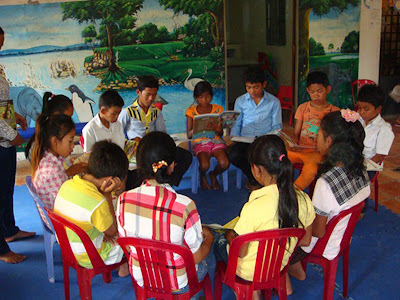 The children are all HIV positive and they are attending the monthly forum of Mondul Mith Chouy Mith (friends helping friends) known as ‘mmm.’ The forum was initiated in 2005 by Cambodia’s Ministry of Health with UNICEF support as part of its paediatric care service. Transport and meals are provided as an incentive for children and their caregivers to attend. The child-friendly welcoming environment is designed to encourage HIV infected children aged 18 months to 15 years to follow their treatment regimen and get regular health check-ups, while providing a safe space to relax, play and receive support without stigma or discrimination. 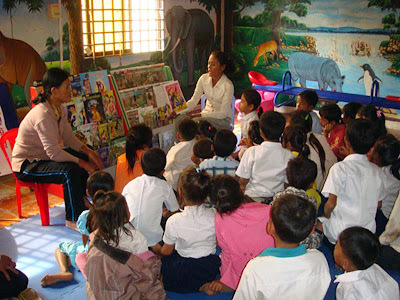 Mondul Mith Chouy Mith forums are held in 35 locations across Cambodia. Twenty-two forums (nine of them with playrooms) are supported by UNICEF and made possible with contributions from the German Committee for UNICEF, the Linsenhoff Foundation, the French Committee for UNICEF and the HIV thematic fund from the Korean National Committee. From 8 a.m. to 11 a.m. at Svay Rieng Provincial Hospital the children are taking part in a variety of activities while their caregivers are watching a cooking demonstration and learning ways to keep the children healthy through nutrition and hygiene education as well as how to respond to opportunistic infections when they arise. Today, the volunteer reading to the children is also HIV positive. Mrs Seang Kunthea,* aged 45, learned her status in 2007. When she came to collect her medication at the hospital, she was invited to join mmm sessions with her 12 year old daughter who was also positive. Following a discussion, the teens at Mondel Mith Chay Mith (known as ‘mmm’) read together in the playroom. The mmm was also life-changing for Kunthea’s daughter. Her mother says, “She felt safe with friends and there was no discrimination in this environment. The doctors and nurses were helpful and showed me how to deal with side effects of the medication. We saw people living positively. Even though they are not infected, I was also able to bring my younger children here too and the hospital staff also brought their children.” With the confidence instilled by attending mmm sessions Seang Kunthea’s daughter, now 17, has a full-time job and is engaged to be married. Her mother is very proud. At Mondul Mith Chouy Mith the children receive information about nutrition, food preparation, hygiene and sanitation, along with the warning signs and risks of opportunistic infections like diarrhoea and fever. They also get the chance to forget about their status and just ‘be kids’ by enjoying the playroom library and taking part in activities like singing, story-telling, paper-folding, drawing and games. Sothavy’s* parents died in 2000 and he was diagnosed with HIV in 2003. He now lives with his aunt and uncle. The 13 year old looks younger than his age, but like the others in the group he already has a wealth of knowledge about HIV thanks to the mmm. “I know the difference between treatments for opportunistic infections and antiretroviral therapy: one is for light illness but the other is for when I’m sick - to prolong my life,” he says. Phaktra shares that through the mmm, “I also learned to take my medication regularly because it helps my health.” And Sok Heng adds, “I have learnt about good hygiene like I have to wash my hands before eating.” It is no coincidence that several of the teens say they want to work in the medical profession in future. For most of them the goal is to be able to take care of the health themselves and their families.